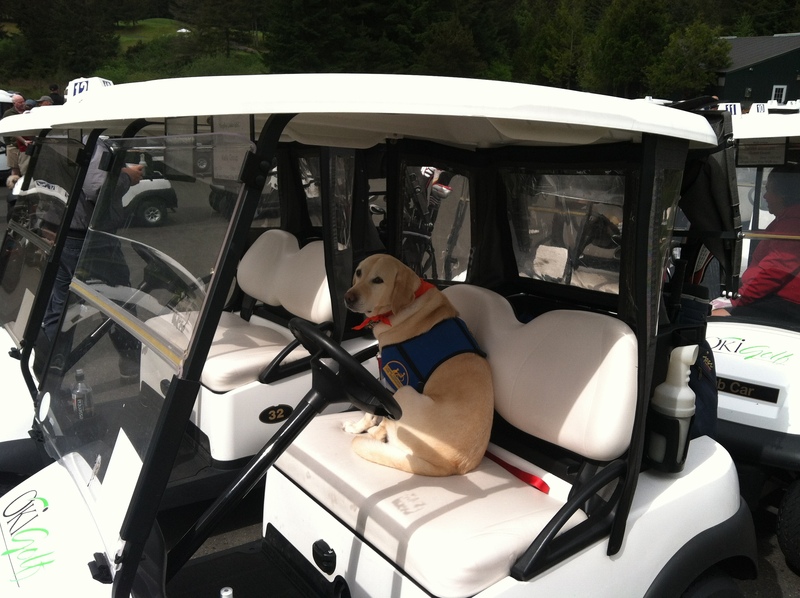 Kerris, the yellow lab who works at the Kitsap County Courthouse, started the weekend early with a round of golf Friday morning at Trophy Lake Golf & Casting. Perhaps you remember the story I did on Kerris in 2010. The Kitsap County Prosecutor’s office brought her on as a courtroom therapy dog to put witnesses at ease during difficult testimony, and generally to diffuse the tension. Her handler is Keven Kelly, chief of District Municipal Court. The two were golfing for charity at the Kitsap Humane Society‘s Fore the Animal’s golf tournament. This is the third year of the tournament, which is notable for allowing animals to tag along. I love imagining dogs in plaid knickers and spiked shoes, wagging their little tails as they get ready to tee off. Alas, it doesn’t work like that. The dogs pretty much just ride in golf carts, slobber and shed. There were 100 golfers and seven pooches signed up for the tourney, said Rebecca Johnson, the Humane Society’s event coordinator and executive assistant. Their goal was to raise $15,000 for KHS.